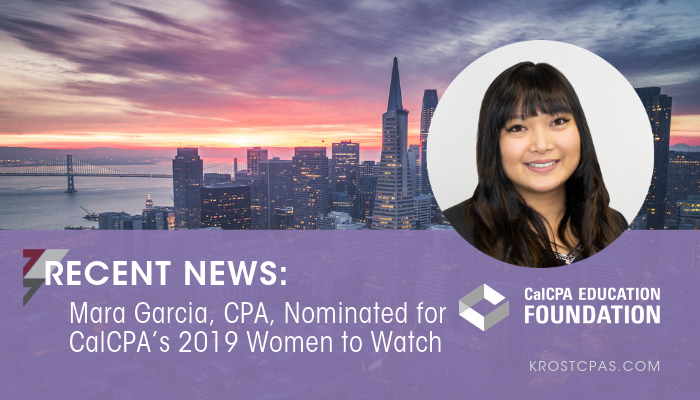 KROST’s Assurance & Advisory Manager, Mara Garcia, CPA, was nominated for CalCPA’s 2019 Women to Watch Award. in partnership with the AICPA’s Women’s Initiatives Executive Committee,celebrates women in the accounting and finance professions who have made signiﬁcant contributions or who demonstrate characteristics that enable them to become leaders. The award recipients will be announced at CalCPA’s Education Foundation Women’s Leadership Forum. Mara has spent her career translating complex concepts into understandable ideas, so her clients know where they stand in their business. She has successfully helped clients increase efficiencies in business processes by providing advisory services on implementation, accounting solutions, and internal controls; and has developed an expertise in many industries, including not-for-profit, manufacturing and distribution, real estate, construction, and technology. She sits on the Professional Advisory Board for the Accounting, Business and Computer Applications and Business Office Technologies (CABOT) Programs at Glendale Community College, and has spoken at CalCPA and California State University, Northridge, events. In addition, She is a member of CalCPA and AICPA, and a certified member of the AICPA Cybersecurity Advisory Services. CalCPA’s Education Foundation Women’s Leadership Forum brings together more than 300 women from all accounting and finance career stages to share experiences, learn to manage career opportunities and reach goals. The 2019 forum is being held on April 26, 2019 in San Francisco, California. CalCPA is a collective of 40,000 of California’s finest CPAs, existing to support the accounting profession. CalCPA has been a leader in continuing education, networking opportunities and resource for decades. If you have questions regarding our assurance and advisory services, schedule a call today. Is Your Firm Prepared For a Cyberattack?